Perspicuity and Inerrancy- a dialogue response | J.W. Wartick -"Always Have a Reason"
Recently, a fellow blogger responded to my post on arguments for young earth creationism. This blogger insinuated that I deny inerrancy because I do not hold to young earth creationism. I’ve run into this frequently and apart from the fact I frequently defend inerrancy (simply scroll down to read several posts to this end), I think that Christians should not falsely represent others. For the record, I affirm inerrancy. If you say I do not, you are giving false testimony against a neighbor. Anyway, once more, this is the link for the post that I’m responding to. Here’s the post he responded to. The issue this fellow blogger brought up is the issue of perspicuity. At some point I’ll try to dedicate a post specifically to perspicuity and inerrancy, but for now I want to focus on how it is used to try to say every single point in Scripture is just utterly clear. I often run into this in discussions over theological issues. One person claims perspicuity for their reading, and thus says that anyone who disagrees denies the clear meaning of the text. Of course, it is appropriate to point out such clear meaning and offer correction, but one has to argue for that clear meaning rather than simply accuse the other of denying inerrancy. Also, apart from the fact that perspicuity has historically changed in meaning due to controversies during the Reformation, there is also the simple fact that defining perspicuity as the clarity of Scripture in everything simply doesn’t work. We’ll see why I say this below. Thanks for taking the time to respond. I have a few thoughts, and I’ll try to be brief. First, the doctrine of perspicuity changed during the Reformation period. As I [very] briefly point out in my post on sola scriptura in the Reformation (https://jwwartick.com/2012/10/15/who-interprets-sola/), this was because the Reformers realized there was genuine disagreement over certain passages of Scripture. Second, there are some issues within Scripture which are genuinely unclear. If you want to deny that, I would suggest you basically have to ignore the text of Scripture. There are a number of issues: for example, underdeterminiation. One looks in vain to find the amount of detail we often wish we had on people that are listed in the genealogies, for example. More concrete examples would be the question of the meaning of certain words, lining up some apparent differences in the Gospels, etc. For example, would you say that Matthew 28:1-7 is unclear? Ah, but it says there is one angel there who speaks to the women. But then is Luke 24:1-8 unclear? But it says there are two angels! I bring up this example not to say there is an actual contradiction (after all, it seems that Matthew just reports the one who talks), but rather to show the appeal to clear verses does not always solve the apparent difficulties. Unless you want to say that either Matthew or Luke are unclear, you have an apparent contradiction which is not solved by a “clearer” text. It is solved by thoughtful reflection and looking more deeply into the backgrounds, the way oral tradition was passed along, and the like. But your post suggests we can simply cast about for a “clearer” text to figure out the unclear. Tell me, which is unclear, Matthew or Luke? Have you never learned anything by being confronted with a difficult problem and striving to understand it? I suspect that you have. I suspect you’ve struggled with specific portions of the text and come out better for it when you came to reconcile the text through other observations, insights, and reflection. If you haven’t I certainly have, and I know many others who have as well. Regarding this text, I’d also simply point out that the interpretation of it is quite forced. Is the intent of the text teaching us that all of Scripture is inspired and profitable, or is it teaching us we can just expect to understand everything? Finally, I firmly affirm and defend inerrancy and any suggestion to the otherwise should be withdrawn. 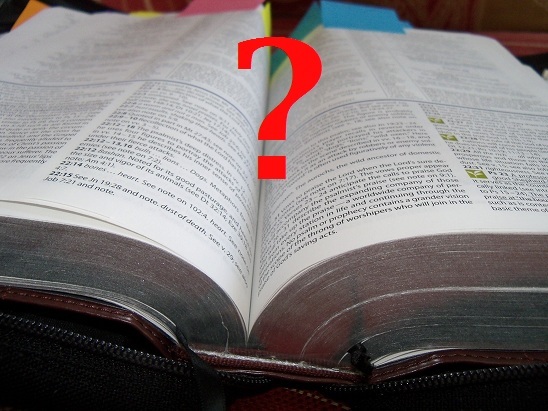 Difference of opinion over interpretation should not be taken as denying inerrancy. Rather than misrepresent your Christian brother, you should stand beside me in a defense of inerrancy. We differ on interpretation of certain texts. Unless you take your interpretation to be itself inerrant and the word of God, I ask you to stop slandering me by implying I deny the doctrine. The argument for strict perspicuity in this sense is almost self-refuting, unless the author is questioning either your intelligence or your integrity. In fact, even your intelligence could not be a factor, because that would require some mental “line” below which even a clear text is no longer comprehensible. The very fact that the two of you disagree on the meaning of even a single verse defies perspicuity to this degree, and therefore only leaves your integrity or motives to be questioned. It is a very serious thing, indeed, to question a brother in such matters, especially with no other supporting evidence. It was my investigation and reading writers such as you that allowed me to come out of my defensive shell when it came to such cherished beliefs as YEC, that I held so dogmatically upon a time that it severely hindered my conversations with unbelievers. Even if I had not changed my viewpoint, I would still be able to converse more intelligently today for the tolerance and grace itself. Thanks for your kind words. I should note the author disavowed any questioning of my adhering to inerrancy but rather said that I could not “consistently” hold to inerrancy and anything but YEC. I agree regarding the questioning of others. As I said in this post, I think there is a line to be crossed that one can say that someone is specifically denying the text (i.e. if one were to say that, for example, there are two deities in the Bible–a statement flatly contradicting the unified teaching of the whole Bible). However, the line is not clear and it also seems to definitely not be where he wants to draw it. I appreciate you telling me about how my writing impacted you. I’m curious to read more if you’re willing to share. I could be wrong, but I would venture to guess that the person arguing for strict perspicuity is also a KJV-only guy. Am I correct? Seriously, it seems almost laughable to say that in all of the Bible there are no difficult texts, no hard thoughts to work through, etc. Good grief! What does one do with 2 Peter 3:16? I can see this is craziness, even if I side more with the YEC camp. The author came from a KJVO background but has written a number of articles responding to KJVO arguments and refuting them. I am not a KJV onlyist though I held to that position in the 90s. It would be helpful to actually go and read my article to see where I am coming from. Read my response in the comment to JW who left a comment that reads similar to this article here. “Strict” perspicuity is something of a misnomer. I am not saying there aren’t difficult text in the Bible, but perspicuity merely states that those difficult texts can be understood because the Bible is sufficiently clear to ascertain them. Roman Catholics historically argued against perspicuity based upon similar reasoning that is being argued here. For example the Trinity. But the Trinity is not a difficult doctrine unless one is trying to argue against the concept of the sufficiency of perspicuity. Much of what is being labeled “difficult” is really exaggerated, and I would argue, exaggerated for the purposes of arguing against perspicuity.